When you come into Anderson, you are immediately captivated by a certain wonderful scent of spices that makes you want eat everything right away. 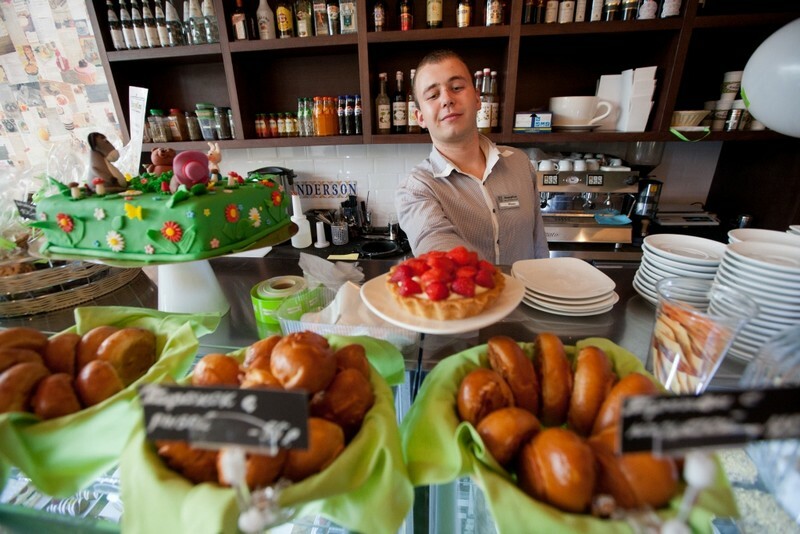 Belgian waffles, almond cakes, éclairs, patties, cookies… Anderson café and confectioner’s network is unique in its own way. You always feel cosy as if you were home. This is a perfect place to take your whole family including its youngest members. 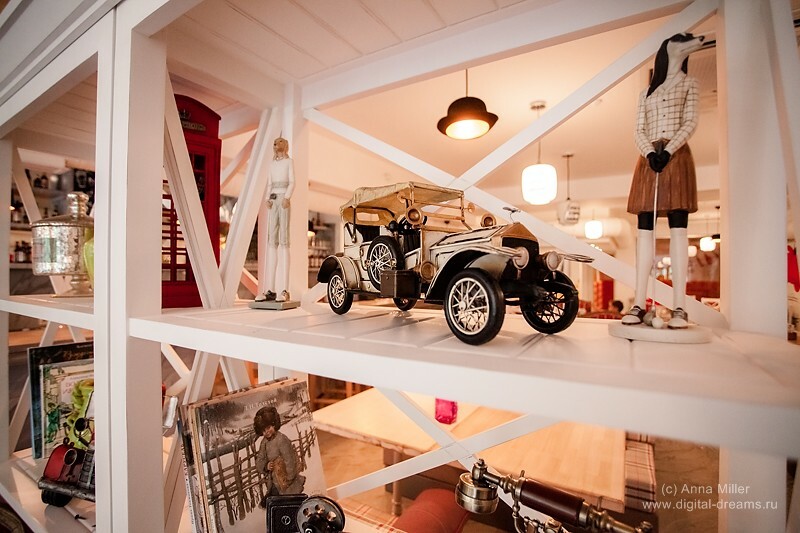 Anderson has special menu for children, a whole lot of toys and books to suit any taste, and a spacious playing area. 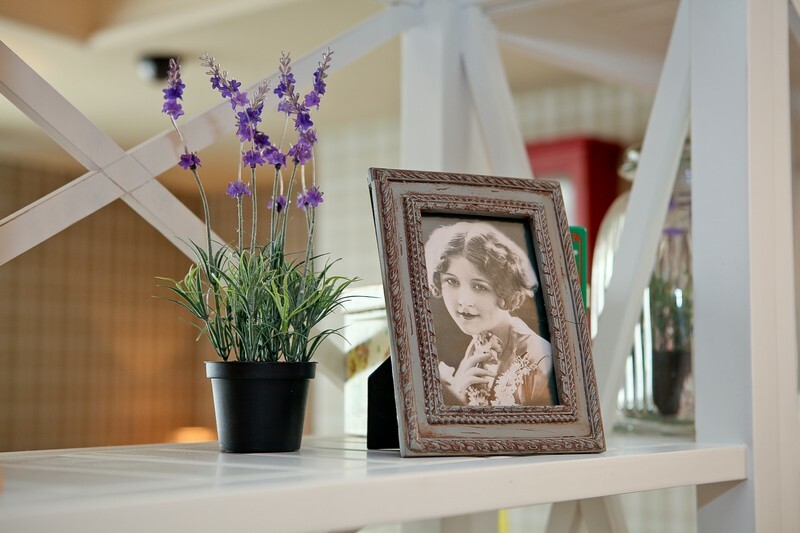 Anderson’s menu consists of European and Italian dishes, filling breakfasts, home-made lemonades and a huge variety of wines, as well as the most delicious desserts, all made in-house. This is an ideal place to have breakfast or a family lunch, a romantic date or a business meeting. 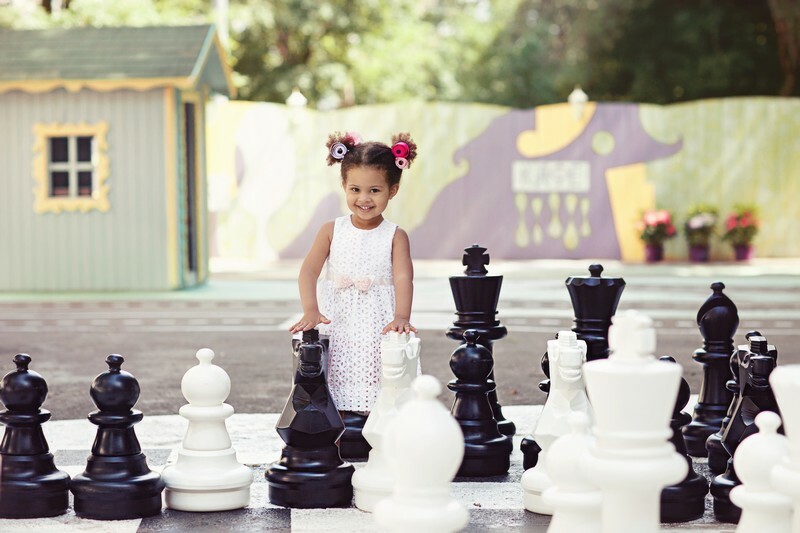 Anderson is also a perfect place to celebrate your child’s birthday or any other family event. 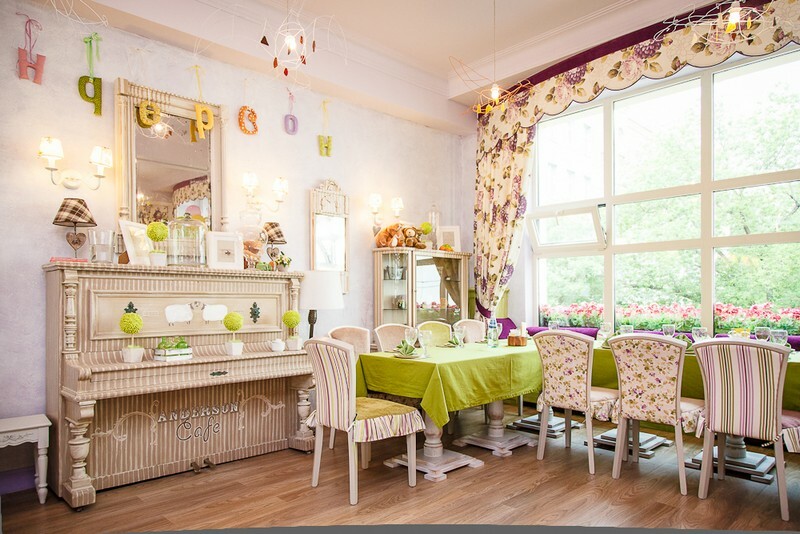 Here you will find separate banquet rooms, friendly staff, tasty food, soap bubbles and photos with friends as a souvenir. Children will definitely like amazing cakes made to order: car cakes and guitar cakes, book cakes and doll cakes, cakes with the figurines of the favorite cartoon characters and fresh berries. 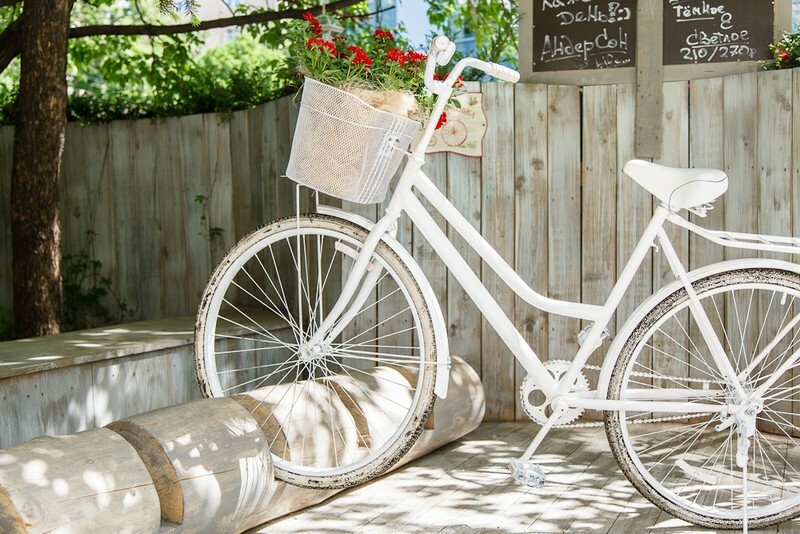 Besides, you can order any celebration with door-to-door delivery. Are you holding a festival, concert, exhibition, conference or competition? Entrust all your culinary needs to Anderson’s catering service and enjoy the best Belgian waffles and chocolate muffins, almond cakes, special sandwiches and bruschettas, original cakes and masterpieces of domestic cuisine. There have been dozens of important and at times hard events on the experience of Anderson’s catering group. 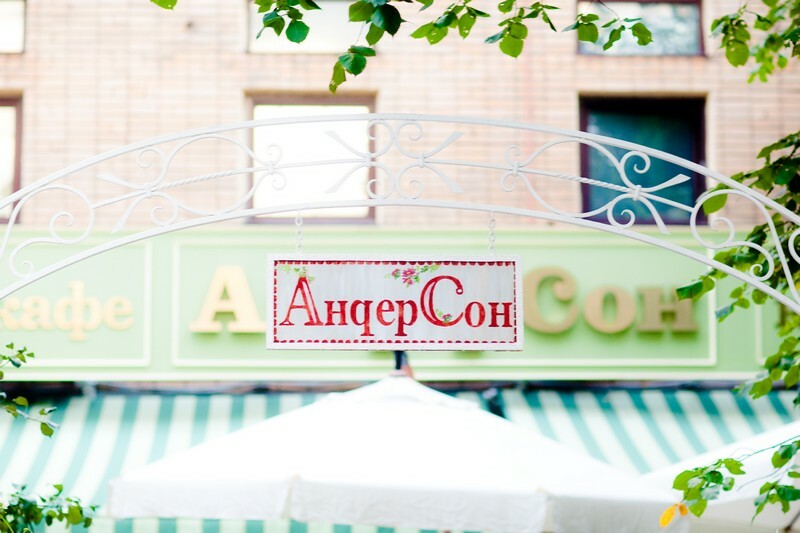 “Anderson” family café and confectioner’s are always happy to welcome foreign guests. There is a menu in English and managers are always ready to assist you. 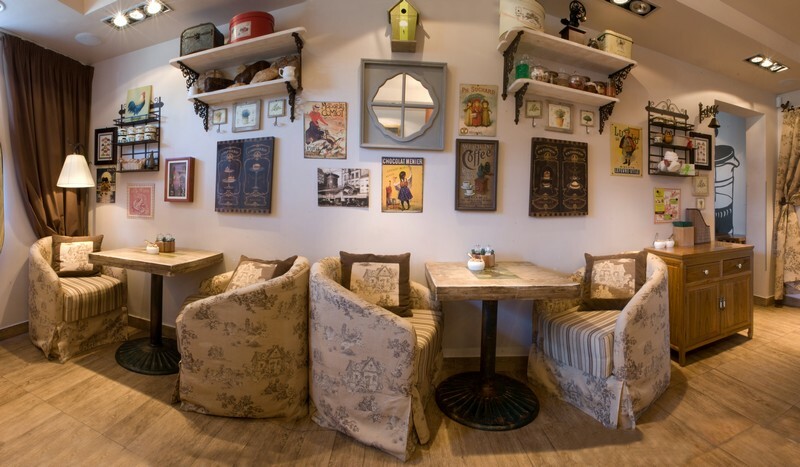 Moreover, you may feel at home in all our cafes, where everything – interior, atmosphere, food – is nice, pleasing and tasty and in European style. Here you will be welcomed by quiet and warm interior. 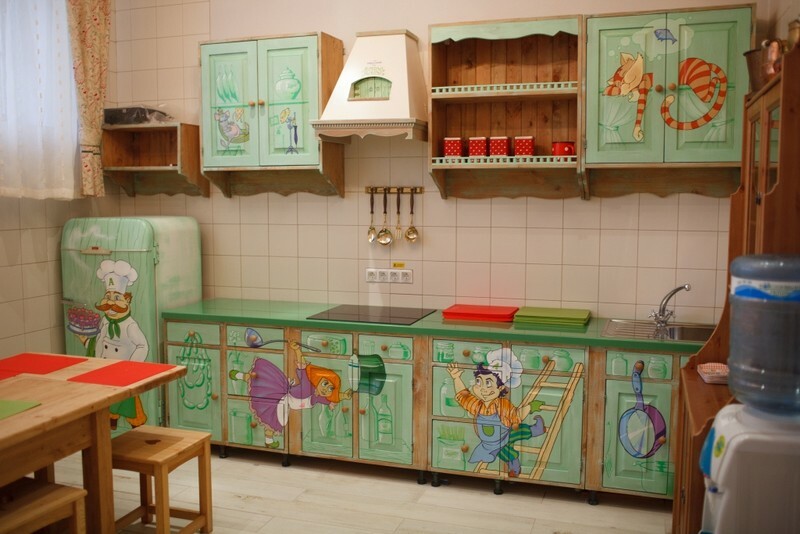 Toys, good books, age-old candy boxex and various details of interior create a certain magical atmosphere. For breakfast, you can always order curd fritters prepared from home-made curds, Belgian waffles with maple syrup, omelettes and porridges, special Anderson tea with spices or espresso. That’s what you should start your day with! Weekends from 10 a.m. till 11 p.m. 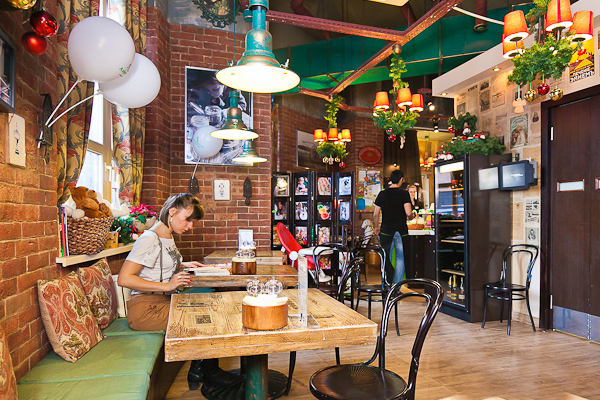 The smallest of all Andersons places, yet home-like and friendly, it is situated just ten paces off the Chekhovskaya metro station. The cosy atmosphere is favorable for small talks, business meetings and, of course, romantic dates. 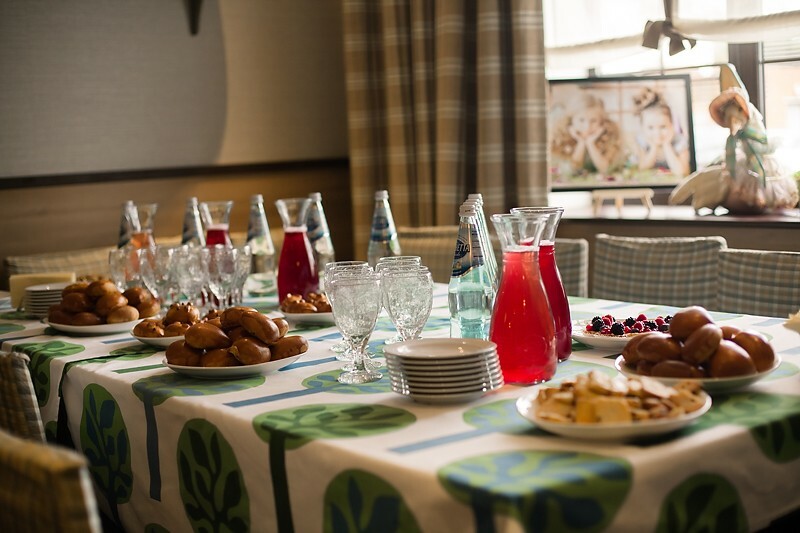 Special breakfasts always wait for those who are in a hurry for business affairs. For lunch and dinner there are pizzas, pasta of the day, soups, and salads. In addition, there are Belgian waffles with maple syrup; honey, chocolate or cranberry cake; almond pastries with raspberry, big pies and bruschettas. From 9 a.m. till 11 p.m.
Daddy’s Anderson occupies two floors. 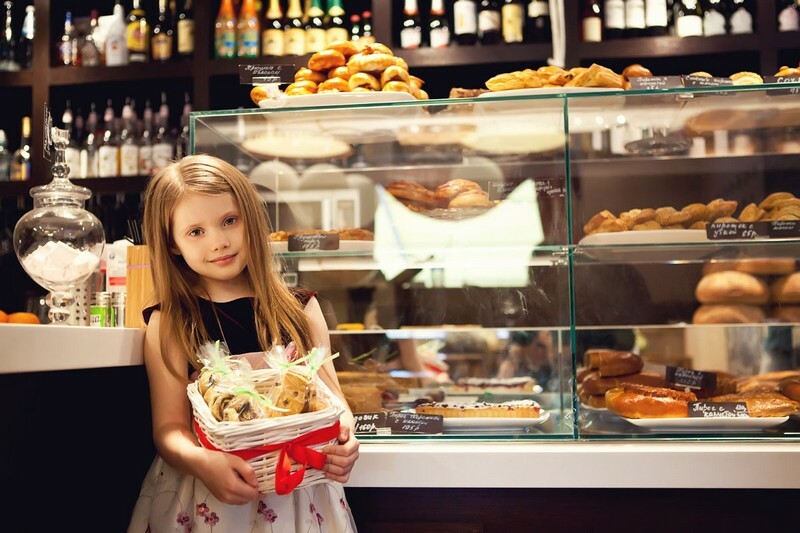 On the first floor there is traditionally a cozy confectioner’s with two showcases full of fresh baked goods and desserts. On a huge table there is a big unique exhibition especially for creative guests, such as interesting newspapers to read, sketchbooks and pencils for drawing. In a quiet corner under the stairs there is a soft couch waiting for family gatherings. On the second floor there is a spacious café area with couches and several big free-standing tables for close-knit groups. A kids table with small red chairs is waiting for the youngest guests. 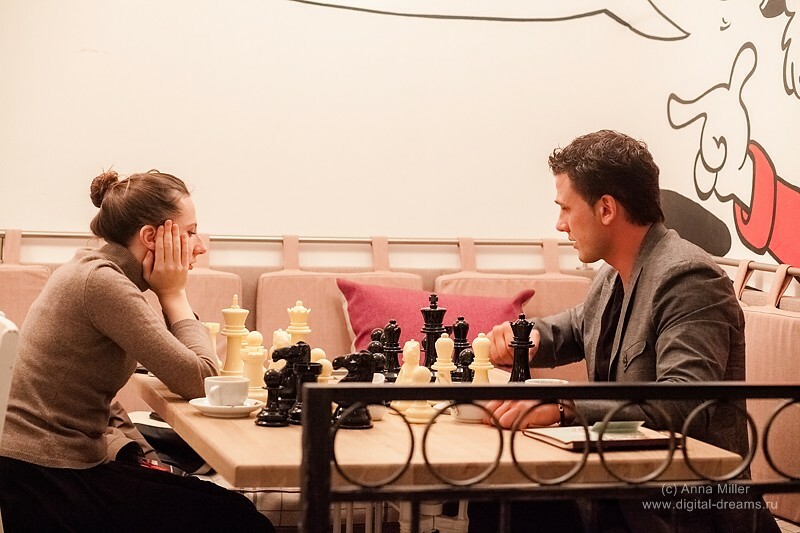 Besides,guests will find here two big chess tables appropriate for both playing chess and eating. 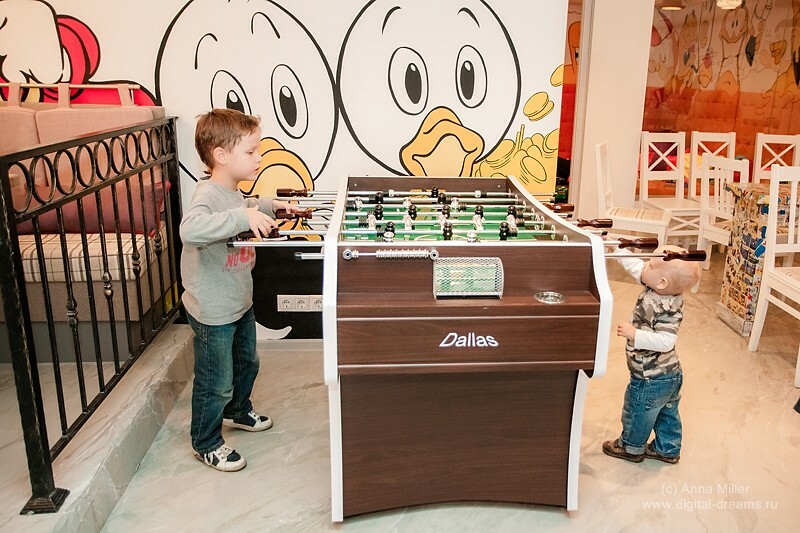 Also, there is a real wooden aerofootball placed specially for dads and their children. The playing room in Daddy’s Anderson is made of glass yet it is safe because of the anti-vandal glass. For older kids there are computers with game attachments, wheel, recent games, and pads. For the little ones we have prepared the best books and toys. Besides, all the children may try our toy boxing mannequin for stress release, and a real drum set! Moreover, you will find in Daddy’s Anderson completely different menu, which is full of meat and various snacks and soups especially for men. Mums are not just welcome here, but highly recommended. 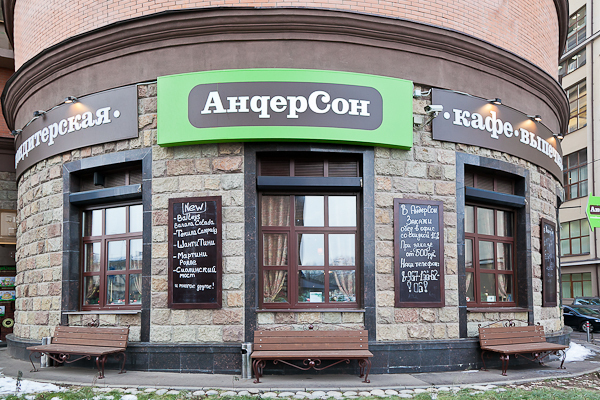 Weekdays from 9 a.m. till 11 p.m.
Anderson on Leningradskiy Prospekt is a good and tasty place with the unique atmosphere. 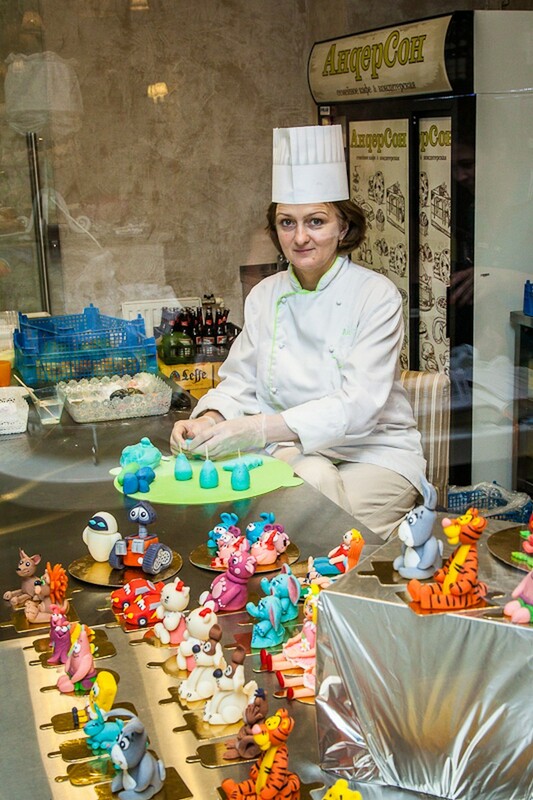 On the first floor the guests will find themselves in a confectionary’s with the yummiest pastries and a glass room, where confectioners make marzipan figurines for our special cakes. Second floor is a restaurant area with the corner for our smallest guests who haven't started to walk yet. We have prepared comfy chairs, powder, swaddle table, playpen, cradle and diapers for them. The third floor is completely at children's disposal. Here the little ones find themselves in a magical forest. A dry pool with thousands of many-colored balloons, chamber of horrors full of creepy things and kids banquet room with small red room are waiting for them. Everyone can also touch a huge real-looking spider that is found in the attic. You can reach it by the stairs leading from the chamber of horrors, and have fun there watching cartoons on plasma TV and looking at parents from the upstairs. There is a special salon-room for the girls where they can make crazy hairstyles using hairsprays of different colors in front of a big mirror with floodlights. Besides, there you can find the best books, toys, table football, cars, teeter-totters and playpens. 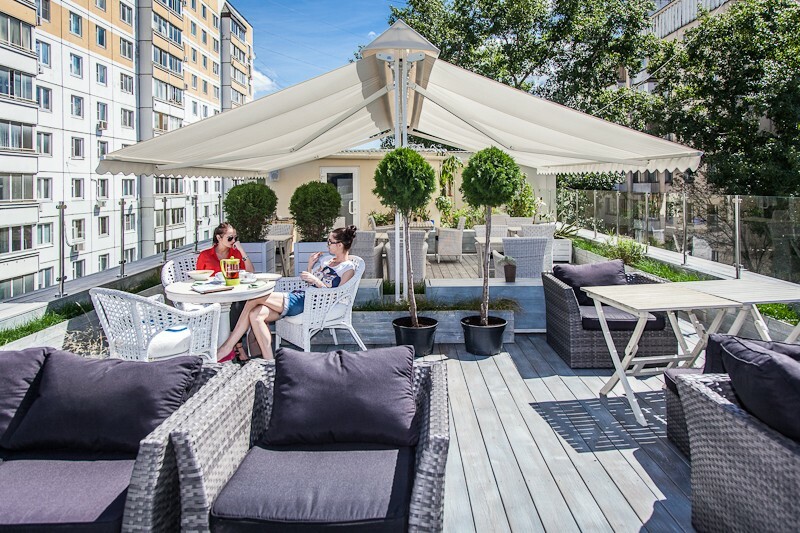 In this Anderson there is a café on the roof perfectly suitable for romantic dates and dreaming of adult guests. If you are afraid of height, there is a big terrace in the yard. A cute small yellow Zaporozhets car will meet you in front of the door. The little ones can get in, turn the wheel and push the buttons. In winter a big decorated Christmas tree is put there, and children together with Santa Claus sing and dance in a circle round the tree and play snowballs. In a big and functional Anderson on Gilyarovskogo Street absolutely unforgettable atmosphere reigns. This is a spacious house where friends and fellows with children get together on weekends. 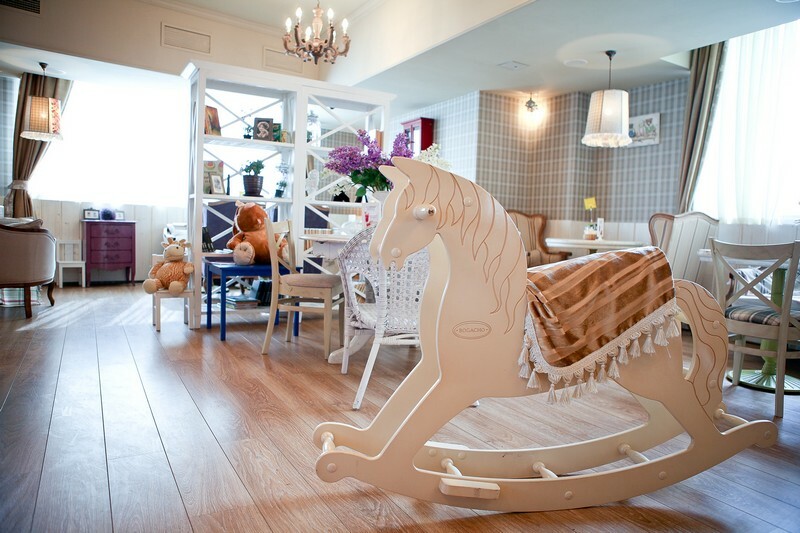 The kids’ room adjoins: the main hall of the restaurant, where you will find a grand piano with red and white stripes, and a wooden rocking horse; banquet room with a fireplace and a café with a showcase full of fresh cakes and pastries. But the crowning glory of this place is its big wooden ground that serves as a summer terrace and turns into skating rink during winter time. 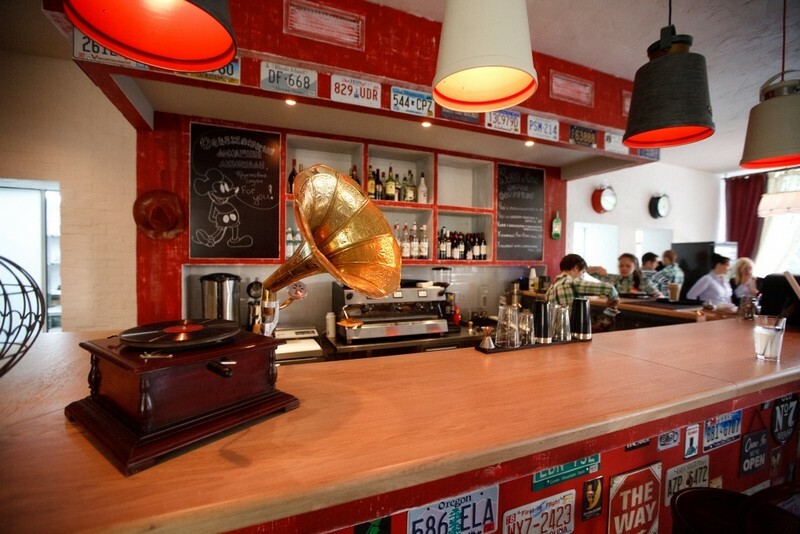 Confectioner’s: weekdays from 8 a.m. till 10 p.m., weekends from 9 a.m. till 10 p.m.
Café: from 11 a.m. till midnight. 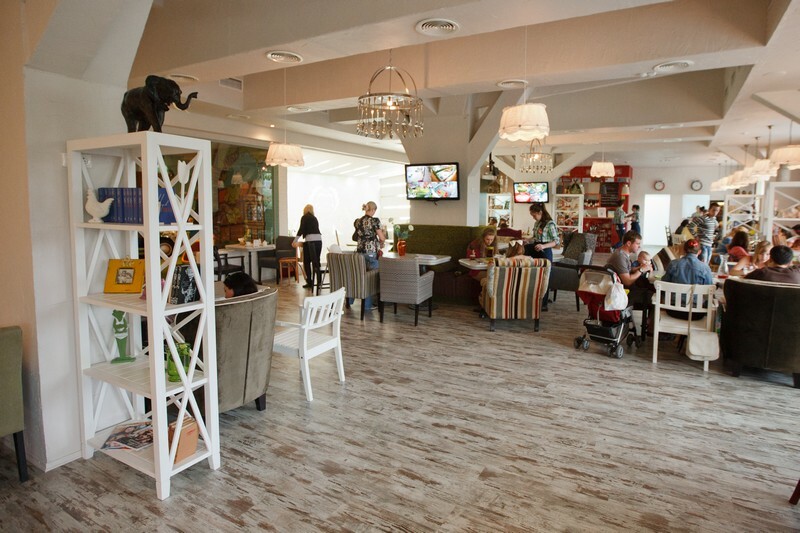 This Anderson café on Ostrovityanova 5 is situated not far from the entrance to Troparevsky Park, and the residents of the neighboring houses can come downstairs to have breakfast right in slippers. Children are the most welcome guests here. 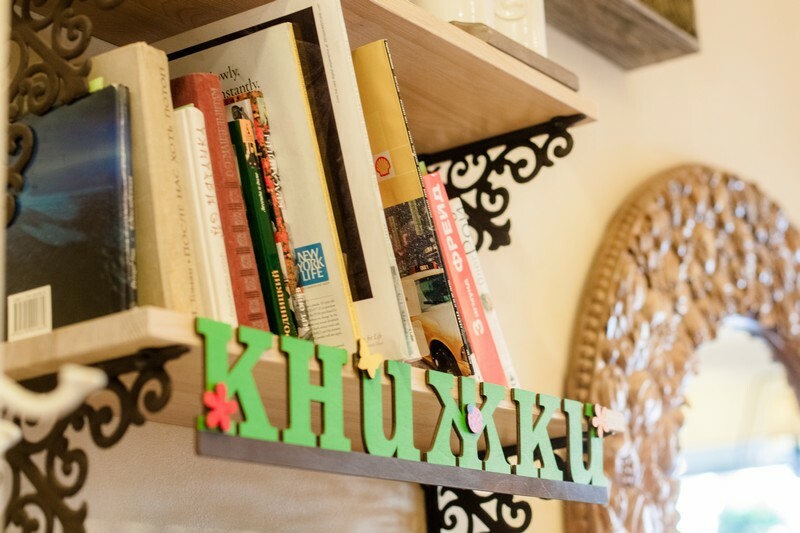 We provide them with kids menu, comfy chairs, a happy room with cute toys, interesting books, a blackboard with chalks and a soft construction set. 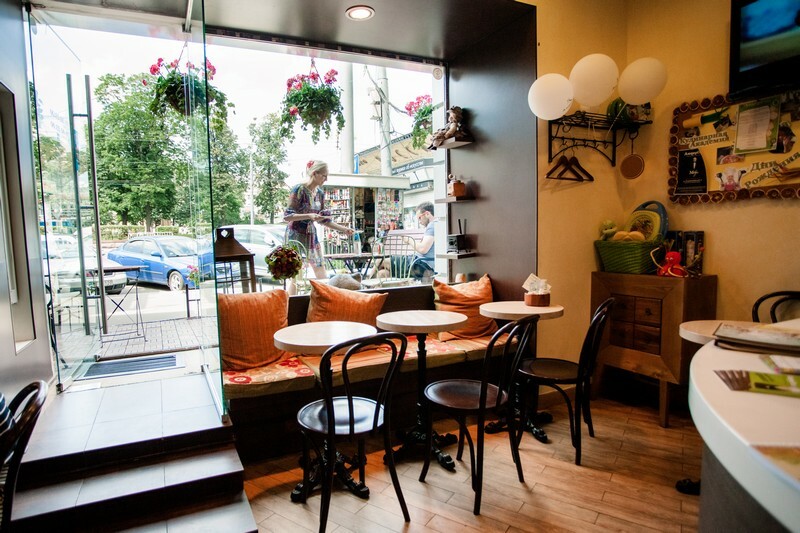 From 8.30 a.m. till 11 p.m.
A small but cosy and good Anderson is located just in a five-minute walk from Bratislavskaya metro. Our guests will find here Provence-style stairs leading to the main hall and confectioner’s with charming smells of fresh-baked pies and berry desserts. 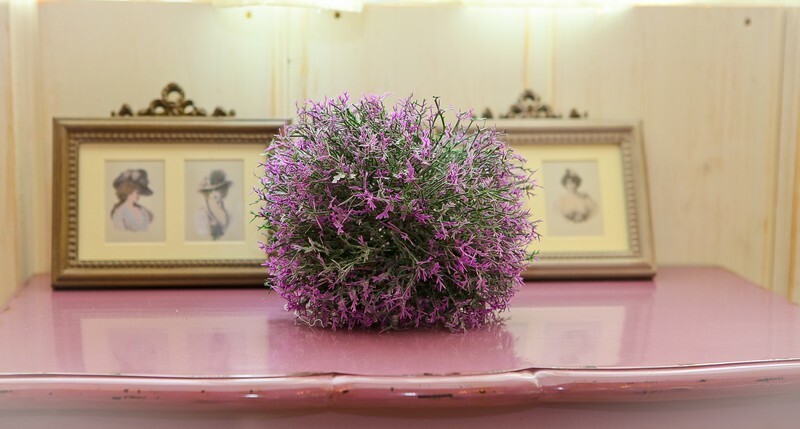 There are comfortable tables and chairs, shelves with books and photos, fascinating stand lams, bunch of lilac. The atmosphere here is really home-like. In this Anderson there is even a true house for a “brownie”! It is also a very interesting place for children. 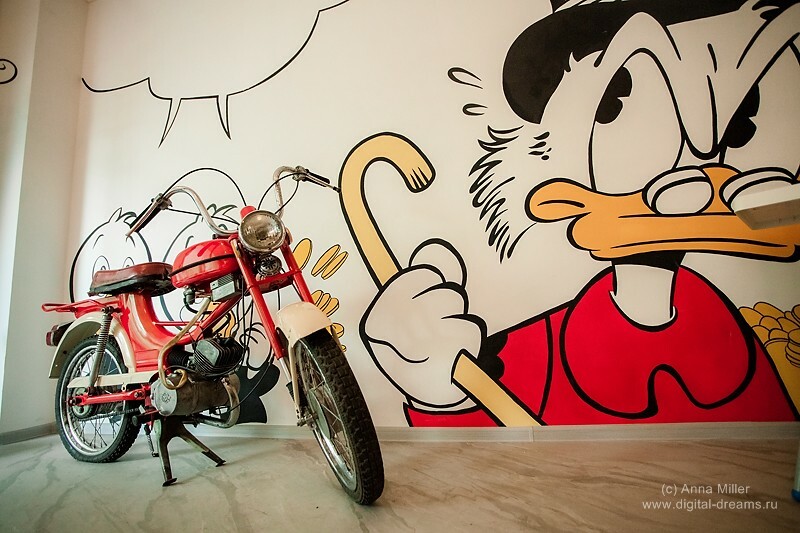 There is a soft leisure room with the cartoons so that the parents have no worries. A playing room is full of numerous amazing things, and colorful books. And above all, there is not just an ordinary swimming pool, but the whole room with various many-colored balloons. We have also prepared a set of diapers; a changing table and high chairs for your comfort. The banquet hall here is perfect for celebrating both kids’ birthday and their parents’ holidays. 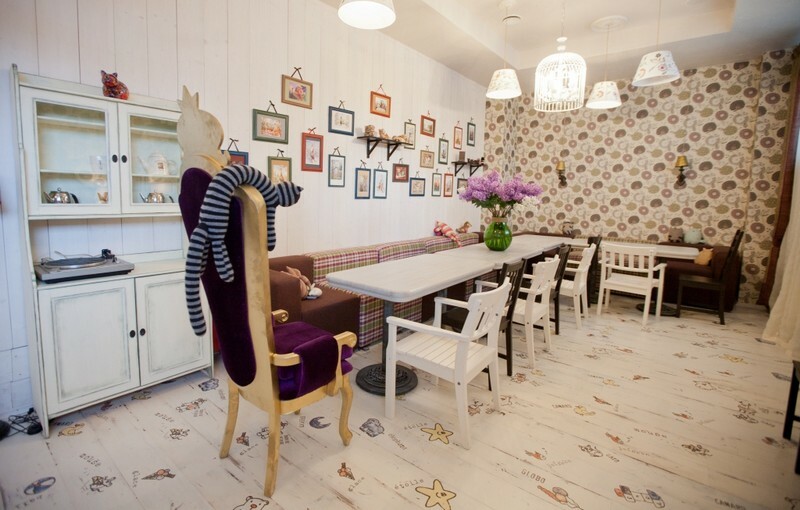 It is a rather bright and spacious place with flower wallpapers and stand lamps covered with cat prints, which fills the hall with a special charm. 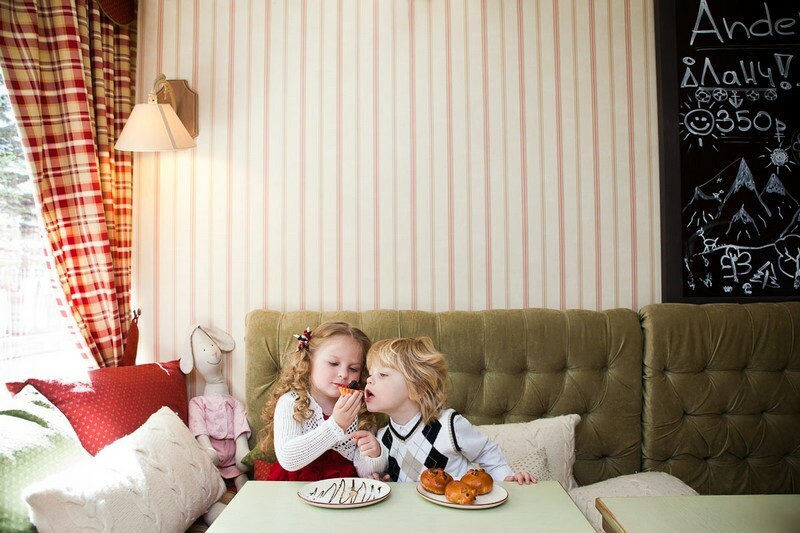 Mon - Sun from 9 a.m. till 11 p.m.
Anderson Kids Club is a fairy-tale place where children find themselves at home. There are two cosy halls: one for children, and the other one for their parents. A big playing area with a real stage, slide and a dry pool are at children’s disposal. The other hall offers DJ console for the older kids. 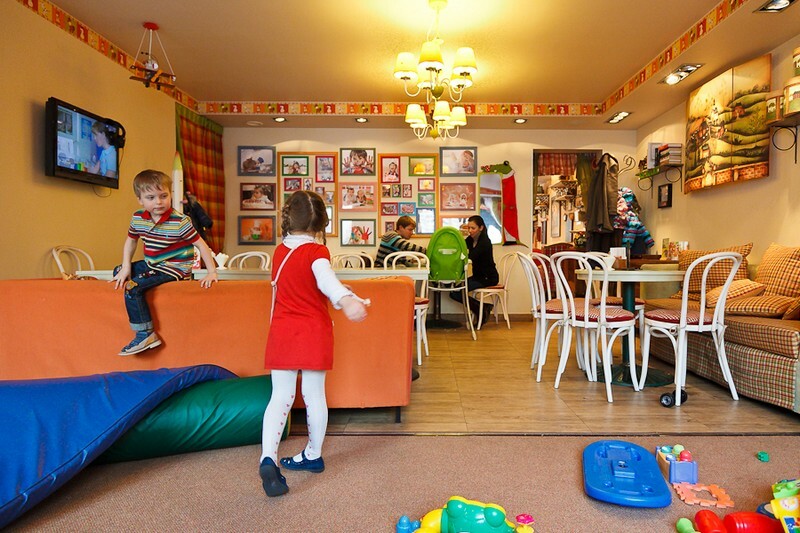 At the same time, the club works as a café so that parents also feel good here watching their children’s play and having breakfast, lunch or dinner in such a cosy place. For variety’s sake there are comfy pouffes, Wi-Fi and a big-screen television with wireless earphones. From 10 a.m. till 10 p.m. This is the only Anderson situated outside the city yet visiting it is a must because it is the biggest and the most interesting one. You will want to come here over and over again to study every little detail, to open every door and find out what is in there. 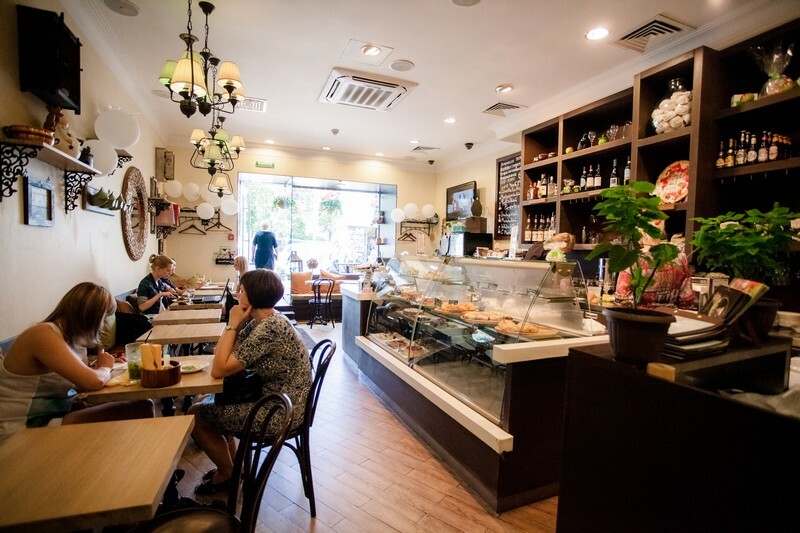 The first floor is occupied by a bright and lively confectioner’s with high ceilings. The desserts attract you from the showcases, and there is a small terrace fenced in flowers that can be seen out of the open door. Wide stairs leads you from the café to the second floor inviting guests to the spacious restaurant area. A whole lot of shelves with unusual things, as well as table with big chess pieces and a stage will draw your attention. You can watch cartoons right on the walls of the stage. At the end of the restaurant area there is a contact bar where you can take your time examining original number plates from the USA. There is a special world in Anderson, where children rules and happiness reigns. 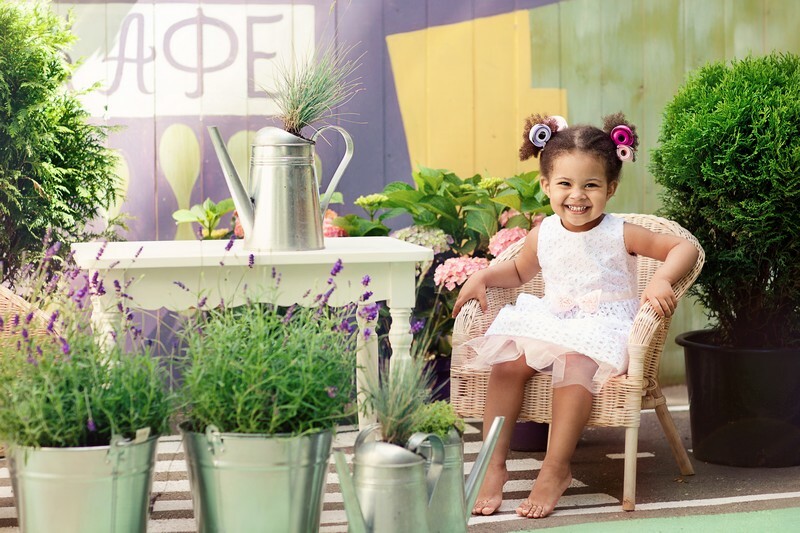 In the playing area there is a pretty old Zaporozhets car covered with chamomile paintings, three-storey labyrinth and a room with many-colored balloons. There is also a “cartoon office”, where the kids can lie on soft pillows and watch something great. In the kids area there are all sorts of toys and interesting books. There is also a house for the girls, “design office” for the older kids and crèche area with rattles for the youngest ones. Just there you will find a feeding room, highchairs, cream and diapers. We offer British corner for the big companies. 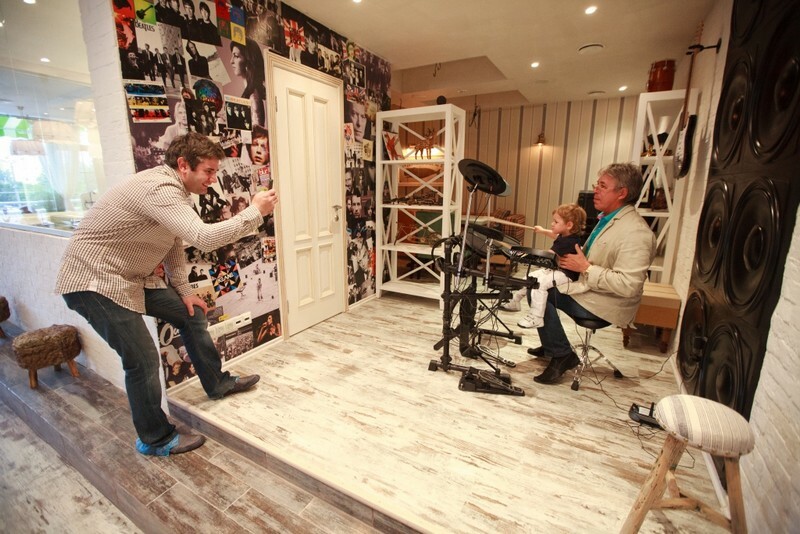 It is a private room with a big table inside, British flag on the wall and drum installation with a real bass guitar right in the corner. You will also find a private place for romantic date here. It is a cosy balcony made of white wood with tables and green swing chairs under the sun blinds. During summer you can enjoy here not only fascinating interior, but also barbeque. Mon – Sun from 9 a.m. till 11 p.m.
To celebrate a birthday or a family holiday, an out-of-order wedding and a fun corporate party, to hold aconference, business meeting or any other event is possible in the spacious Factory banquet hall, which is readyto welcome from 50 to 200 guests. 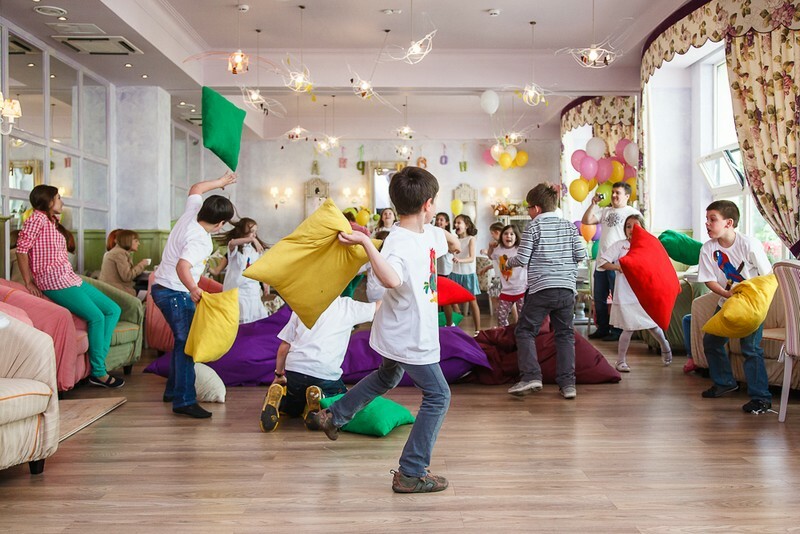 For adults Happiness Factory has been devised to have a tasty menu and a beautiful interior, and fun andcreative space has been made a reality here - in the banquet hall for the little guests. There is a theater with a large projector under the ceiling in a secluded mezzanine; the spiral slide can be used,to get down from there towards adults.And in addition to the traditional AnderSon good toys and books, there is even a wall-painting and a “floor-classics” with crystals spread inside!